Industrial Scientific Australia have introduced the MX4 iQuad that can detect from one to four gases. The MX4 is the new addition to Industrial Scientific’s line of iNet-ready gas detectors. The MX4 iNet-ready gas detector offers an alternative to buying and maintaining gas detectors. It is a software-based service that increases safety by providing visibility into gas detector alarms, exposure and usage. It keeps gas detectors working without costly and time-consuming maintenance. With iNet, customers do not have to buy the gas detectors. Instead, they can subscribe to iNet and receive gas detection as a service. Using the MX4 with iNet is a better way to do gas detection. Subscribers avoid the common problems of owning gas detectors. At the same time, users are protected by the MX4's and user-friendly features. 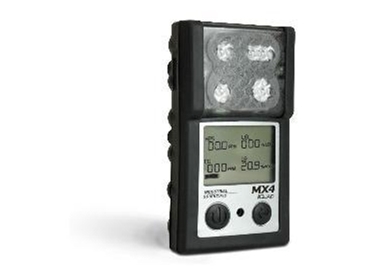 The MX4 iNet-ready gas detector is small, rugged and simple to use. A rubber overmould covers its polycarbonate housing to protect the MX4 from high-impact bumps and drops. The housing has also been third-party tested and certified IP66 and IP67. This ingress protection rating indicates that the MX4 is dust-tight and resistant to both water jets and submersion. The MX4 iNet-ready gas detector uses a combination of three alarms. Ultra-bright LEDs, a 95 db audible alarm and a powerful vibrating alarm warn users of hazardous gas levels.